Norbay is a conventional cruise ferry featuring a host of onboard facilities including delicious complimentary food, a TV lounge, a bar, an onboard shop and comfortable cabins. Onboard the Norbay you’ll find comfortable en-suite 2 bed cabins with a choice of either inside or with a sea view. 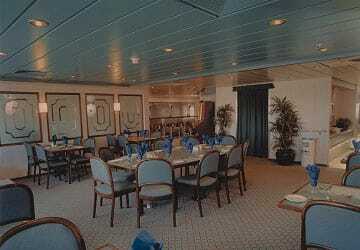 Meals are included in the price and complimentary tea, coffee and fruit juice are available throughout the sailing. If you've forgotten to change currency, you can do this onboard at the Bureau de Change. There are no lifts to the main passenger areas and access is by a staircase therefore the Norbay may be unsuitable for the infirm, disabled or young children. Please Note: Whilst we have taken great care in making our Norbay guide as accurate as possible, onboard facilities, services and entertainment may vary depending on the date and time of year that you travel, facilities mentioned may change without notification and ferry companies reserve the right to operate vessels other than those mentioned at time of booking without prior notification. Couldn't of asked for a better crossing there and back to and from Ireland. Polite staff, excellent food, quickness on and off and port staff all excellent not one bad thing. Will book cabins next time though even though lounge seating was comfy. Very satisfied as usual will never go with anyone else. staff, food and service, accommodation cannot be faulted plus the price is good as well. 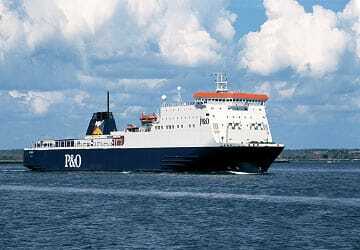 We boarded in Liverpool on the Norbay at 9:30AM on a Tuesday morning. The boarding procedures went very smoothly and shortly afterwards we enjoyed a lovely buffet breakfast. There were few people on board and the sailing was very quiet. We could have taken a cabin for a reasonable price but opted not to and stayed in the salon reading and watching TV. About 45 minutes before our arrival in Dublin we had a buffet dinner which was very enjoyable. The total crossing time was about 8 hours. It took quite a while to get off the ferry (almost one hour) and that was the only criticism I'd have. Overall, I very positive experience that I'd like to do again. "Thank you Mary much appreciated "
Great food. Good clean cabin with shower etc. 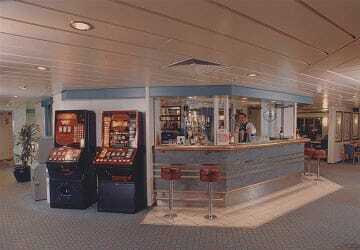 Good on-board facilities in TV/bar/tea and coffee. It's like a mini cruise. We take the ferry regularly to visit home in Ireland as we prefer to have the car with us. Plus when we rang to add our pets on our recent trip the customer service agent was very kind and helpful. We booked a cabin on board coming back. It was basic but clean and functional. To date we have always experienced good friendly staff and good journeys each time. We will definitely continue to use the liverpool to dublin p&o ferry for value for money and good experiences while travelling. "Begin your Journey to Ireland." 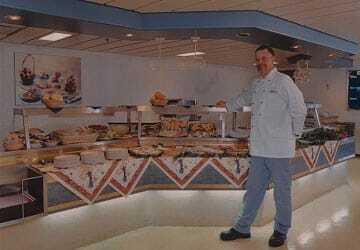 We have used P&O before totally pleasant helpful staff, great meals, good value, smooth sailings even in relatively bad weather can't fault them on anything. The staff on both the crossings on the Norbay and European Endeavour were very helpful, friendly and always actively seeking to help. The boats themselves were very comfortable, spacious to walk around on and the quality of cabin was also a very high standard Highly recommend for the low price offered.